Japan’s top grossing free-to-play mobile game, GungHo Entertainment's Puzzle & Dragons (P&D) for iOS and Android, is estimated to generate between five billion yen ($54 million) to seven billion yen ($75.5 million) a month in the country, according to the Japanese press as translated by industry watcher and analyst Dr. Serkan Toto. Despite the massive success in Japan P&D hasn't really succeeded to take over the Western market. In this post I'll go through the 8 key mechanics, which make P&D so successful in Japan. In my opinion these 8 mechanics are also why P&D hasn't had success in the US AppStore. P&D’s core loop is very simple. Player enters a dungeon, which costs specific amount of Stamina based on the toughness of the dungeon. Stamina reloads over time. 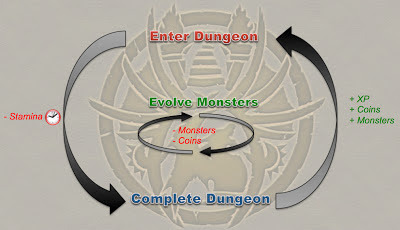 Once player has completed the dungeon they earn XP, Coins (soft currency) and few random monsters. 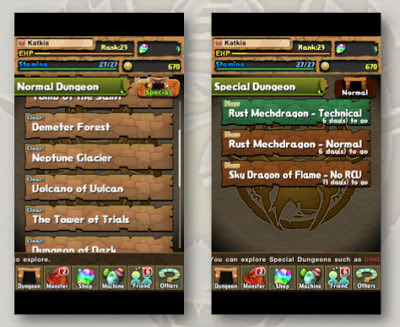 As the dungeons get tougher players need to constantly level up and evolve their monsters. Leveling up a monster increases monster's stats. Leveling up requires players to sacrifice other monsters they own. Once the monster is leveled up to the maximum level player can evolve the monster. 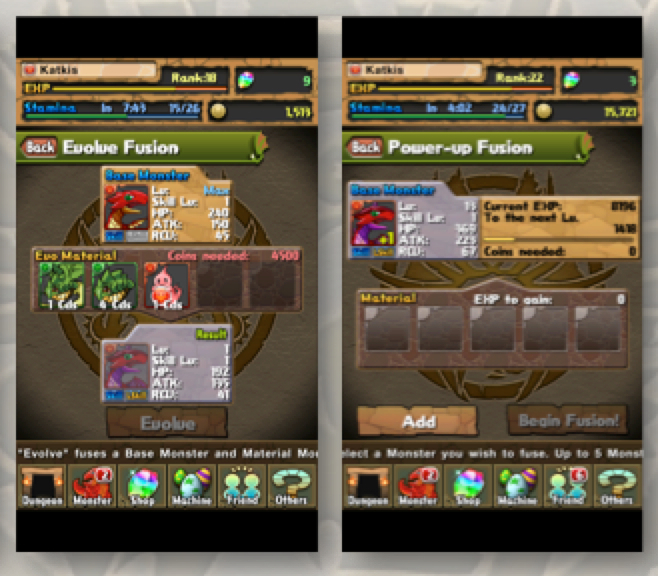 Evolving requires player to have specific set of evo material (rare monsters). Sacrificing and evolving costs Coins and the prices rise steeply hand in hand with the monster's level. On the surface P&D is an extremely simple and rewarding game. 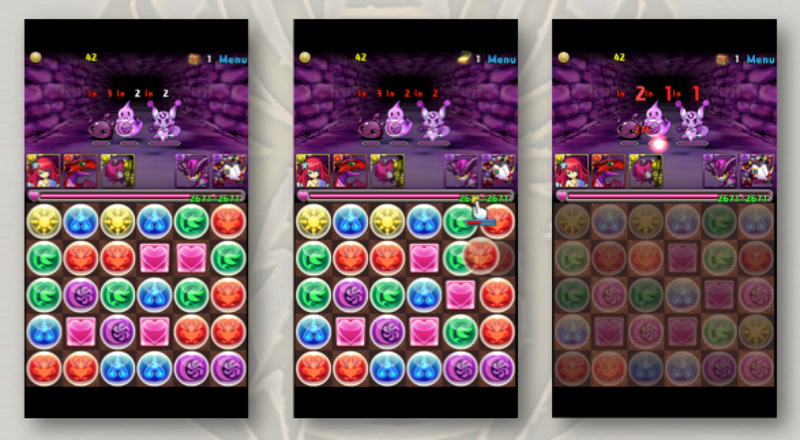 Essentially what player needs to do is play simplified match game and just make sure that the orb colours match the color of monsters they use. The more colours player matches the more damage monsters will cause. It's that simple. Completing dungeons is easy and yet very rewarding as there’s always that element of surprise when player opens up the monster eggs earned for completing the dungeon. The fact that you can play P&D with only one hand and that it requires very little skills just adds to the simplicity of the game. After player has cleared a dozen of dungeons two things happen. First is that player’s monster box starts to get full forcing players to think which monsters they are going to keep and which they going to sacrifice or sell. 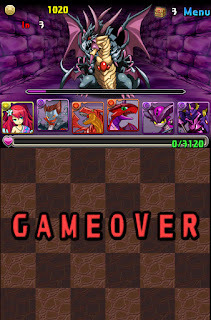 Second is that player starts craving for tougher monsters as the dungeons get slowly but steadily tougher. Demand for better monsters results in players being willing to learn how to get those monsters and thus ready for the complexity of the game. monster collections make P&D very complex. The complexity comes from the whole meta-game that swirls around player’s monster collection. Which monster will I keep? Which monsters will I get rid off? What will my monster team look like? How to make the perfect combination of my monsters’ special skills? What evo materials do I need to find? This meta game also starts to affect players playing behavior. Engagement improves, as the playing is not just about fun anymore. Now every session has a clear target and players start playing more often to earn more monsters they can sacrifice or sell. 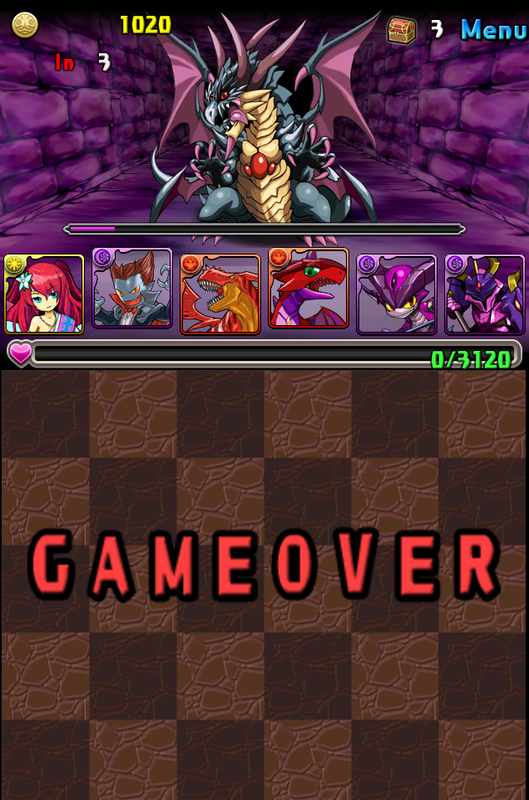 One of the key restriction mechanics in P&D is Stamina, which is consumed every time player enters a dungeon. There are few twists that differentiate P&D’s energy mechanics from the more common energy mechanics that we know from Facebook games. The way energy mechanics are implemented in D&G is very well thought as it enables fast progress in the beginning and slows the progress down once player is more engaged. This is because in the beginning players Stamina caps are very low and thus quickly replenished, but as the game progresses Stamina caps will grow and so will the time it takes for the Stamina to be replenished. Slowing down progression is the best way to drive monetization. Growing Stamina cap has also two additional game design benefits. 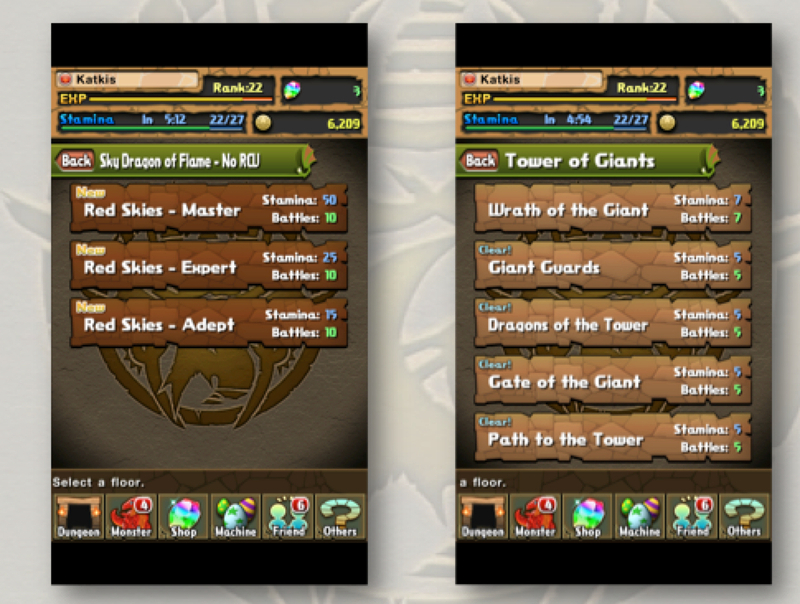 Firstly P&D puts on different Stamina prices on different dungeons. By increasing a price to enter tougher dungeons P&D limits the session length of experienced players. Secondly when there’s no worry that inexperienced players may wonder into tougher dungeons (they just don’t have enough stamina to even enter them) P&D can have those special dungeons visible for all their players thus creating a long term target for even the most novice of players. 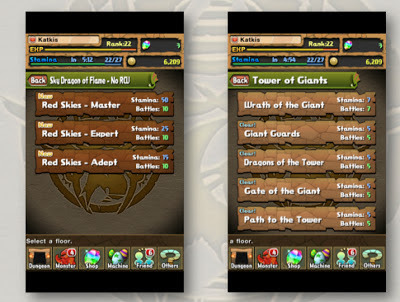 In order to improve monsters players need to first level them up and then evolve them. Leveling up requires players to sacrifice monsters they collect from the dungeons. Once the target monster is leveled up to it’s max level player can evolve that monster into something new and exciting. But evolving isn’t easy, as player needs to find specific set of evo monsters from the dungeons to make the evolvement happen. First players need to sacrifice dozens of monsters to power-up monster into maximum level. Then players can use rare monsters (Evo Material) to evolve that monster into a totally new kind of rare monster, which again can be evolved eventually. Then there’s the issue of Coins as both leveling up and evolving costs. The only way to get more Coins is to complete dungeons. Players can’t even buy Coins with real money. So to progress players really need to invest time. But what’s truly great about the well funcioning monster consumption mechanics is the fact that the monsters are both permanent and consumable depending fully on what player chooses to do with them. 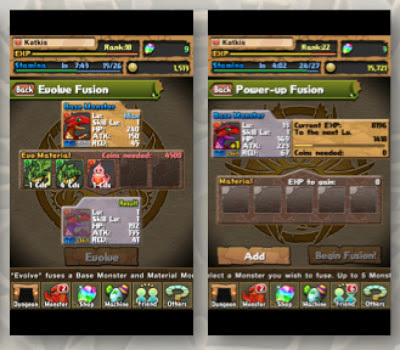 This allows the game economy to reward players constantly with dozens of different monsters. And it also goes hand in hand with the best practice of F2P, which is rewarding players for the time spent playing. In P&D players can’t buy the monsters they want or need. In fact there’s only two way to get new monsters. 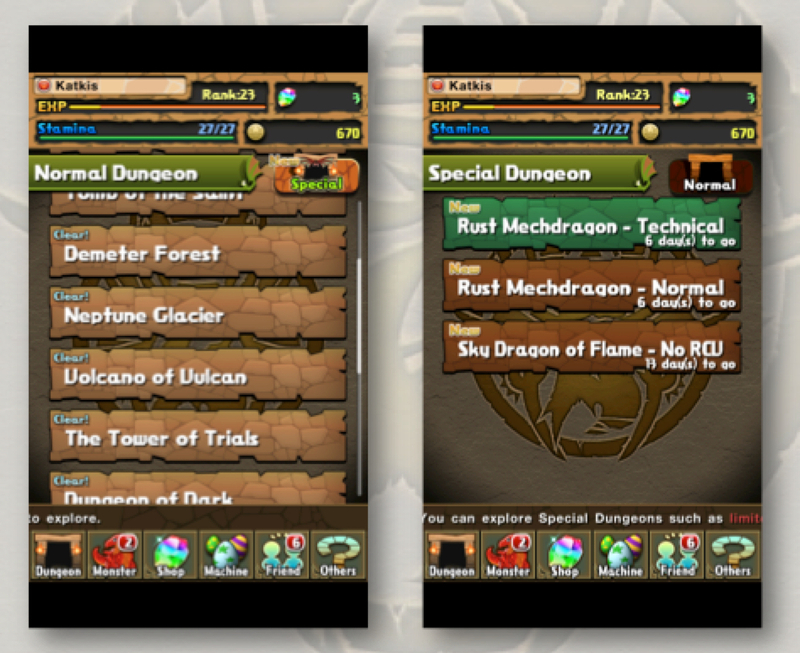 First one is by completing dungeons and the second one is by getting them from the Machine. New monsters come always in eggs, which are then hatched in front of the player revealing a random monster inside. Pull Dragon Machine's hand, watch an egg pop out and see it hatch into a random monsters. Purchasing new monsters is like playing slots, except that player always wins. The lack of direct monster purchase and randomness are what makes this game monetize so well. 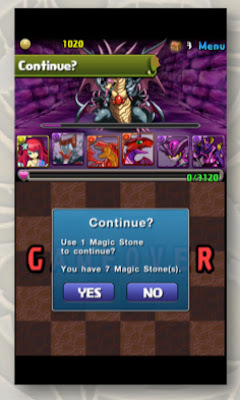 First of all by taking away the possibility to directly buy the desired monsters P&D increases the engagement. Think about it. If players wouldn’t need to complete tens of dungeons just to level up a single monster they wouldn’t feel as invested to the game. The lack of instant buy possibility also keeps the economy of the game working as players cant run through the dungeons with super powerful monsters they just bought. Finally the randomness also takes away the cap from purchases. Instead of buying that one monster player needs she’ll end up using the tens of dollars into Machine, which spits out random monsters. The fact is that basically all of the F2P games are dependable on new content delivered via updates. A good content update adds something new to the game that players will want and need. 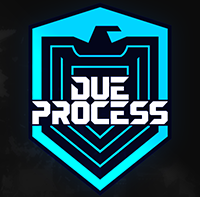 Something new, that will encourage players to continue playing to earn this added content. Something new, that will make some players want to spend their money to get it instantly. But there’s a difference between adding new content on monthly bases and finding yourself in a content treadmill. Content treadmill, where all the time of the development team goes into adding new content just to keep the players away from boredom. And when you’re concentrating just on the content you’ll fail to improve all the other aspects of the game, such as stability, graphics, UI, brand, social etc. Level based games are infamous examples of content treadmills. Once player has beaten all the levels they will quit playing until there are new levels added. You can reduce the risk of ending in a content treadmill with game mechanics and game design. For example adding social channels such as chat, groups and alliances is a good way to have players adding content to the game. Player vs. Player is another great way to avoid content treadmill. The way P&D avoids content treadmill is by having extremely easily producible content. Players progress by beating dungeons and those dungeons are very easy to develop. Dungeons look pretty much identical as only the color of the walls and the opponents change. So adding few hundreds dungeons is not a big deal. It doesn’t even require a new build, just a simple server side update. Fire dungeon, water dungeon, earth dungeon... All of them look identical and thus are very easy to create. I’d say P&D is a social game in it’s own way. There’s no chat. No player versus player mode. No direct interaction with other people. No guilds. And no social network integrations. Yet every time player enters a dungeon they enter it with another player as their helper and the amount of friend requests players send to each other is huge. Before entering a dungeon player has to always choose a helper, which is a monster from another player. Every time players uses another player’s monster as a helper the helper’s owner receives Pal Points, which are used for the Machine to get new monsters. The more often player plays the higher chance there is to appear as a helper for other players and thus earn more Pal Points. After player has cleared a dungeon they can add helper’s owner as a friend by sending a friend request. Players can have a specific amount of friends based on their rank. The higher the rank the more friends players can have. Using friends’ monsters as helpers results in getting more Pal Points as well as getting additional Leader Skill, which make you monsters more powerful. Having active friends is crucial as player can use helper only once after which they have to wait until helper’s user logs out and logs back to the game. Every time players enter a dungeon they have to choose a player to help them. When the players have cleared a dungeon they can become friends. Having friend helping you out gives you more Pal Points, which are then used to get monsters from the Machine. So in short the social mechanics of the game drives retention by encouraging several logins per day. Social mechanics also drive players to progress as the better helper monster they have to offer the more often it will be used, which will result in player getting more Pal Points. 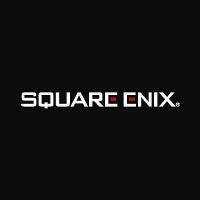 There are several limited time special dungeons open for player to enter. Some of the dungeons are day specific, such as Monday Dungeons while others are just there to provide a serious challenge for the players. But there’s one common element with all the special dungeons and that is that in order to truly evolve monsters players need to complete these dungeons. As discussed in the Gambling Elements above the only way to get better monsters is to evolve them and evolving requires sets of very rare monsters, which players can earn by completing the special dungeons. So in order to progress player needs to play special dungeons and in order to complete special dungeons player needs to have powerful monsters, high Stamina cap as well as some very good helper monsters from friends. In other words, Special Dungeons are perfect fit with the core loop of the game. Special dungeons have time limit and they cost more Stamina to enter. They are also a lot tougher to beat. 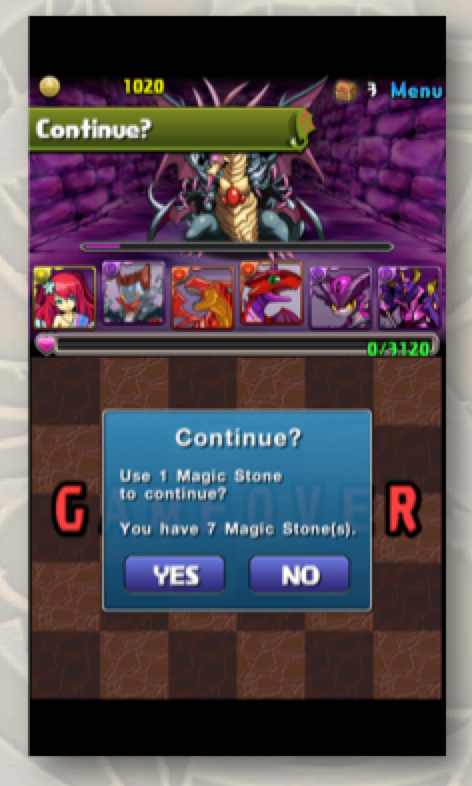 Player needs to beat special dungeons to get rare evo material needed to evolve their monsters. Remember game arcades? Remember playing Time Cop or Virtual Fighter and losing? Remember seing that 10 second counter during which you can insert a coin and continue playing? Well P&D has that mechanic and it absolutely rocks. Pay to continue your game. Simple but yet always extremely efficient. P&D has held on to its number one spot in the Japanese AppStore’s top grossing list since February. Yet when you look at the grossing rankings of the US AppStore P&D hasn’t been able to even establish itself in top 50. It would be easy to say that P&D’s lack of success in the US market is due to the complexity of the game. Without prior experience in Japanese games that rely on evolving characters this game is very hard to understand and enjoy. But Rage of Bahamut made it to the top. So did Marvel: War of Heroes. And both of them are far more complex titles with very similar game mechanics. In my opinion it’s a combination of complexity, mismatch theme and modest user acquisition strategy. You don’t see many monster and card collection games coming outside the Asian market because they aren’t that familiar as a theme to us. Then when you add the complexity to a distant theme it all becomes even more complex for a casual player. And for a more experienced players, who actually understand how to play P&D the lack of PvP is a serious turn off. Finally I assume that GungHo Online Entertainment is not set to take over the US AppStore by any means necessary unlike DeNA and Gree who both can buy their way to the top of the list even if it means net loss.